November 19th is National Carbonated Beverage With Caffeine Day. There aren’t any national brands of coffee soda, but if you head to your supermarket, you may be able to find some regional brands. There are seven foods that contain natural caffeine, all of which are made into beverages. Can you name them? A cup of drip coffee has at least twice the caffeine as a cup of espresso, due to its much larger serving size. However, from a volume perspective, espresso has much more caffeine than drip coffee. Eight ounces of drip coffee contains approximately 65-120 mg of caffeine. One ounce of espresso has 30-50 mg of caffeine. On a per-ounce basis, the drip coffee has approximately 8.1 to 15 mg of caffeine per ounce; the one ounce of espresso has 30 to 50 mg of caffeine. 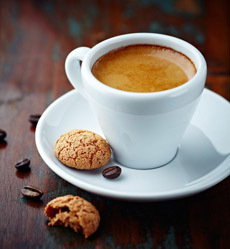 Many people turn to espresso for a hit of caffeine. But you’d get more caffeine with a cup of drip coffee. Photo courtesy Hiline Coffee Co.
2. Conventional tea, the second most consumed beverage in the world after water. The same leaf, Camellia sinensis, makes black, green, oolong and white tea, depending on how long the leaves are pan-toasted. More about the types of tea. 3. Cacao, in cocoa and chocolate products. It’s made from the seeds of a large pod (cabosse) that grows on the cacao trees. How chocolate and cocoa are made. 4. Guarana, a component of energy drinks. The seeds in the berries contain about twice the concentration of caffeine found in coffee seeds (which are roasted into coffee beans); about 2%–4.5% caffeine in guarana seeds compared to 1%–2% for coffee seeds. 5. Guayusa, a leaf from the guayusa tree. Native to the Ecuadorian Amazon rainforest, it is a member of the holly family. The leaves of the guayusa tree are dried and brewed like a tea for their stimulative effects. You can buy the Runa brand in the U.S.
6. Kola nut, used to make cola soft drinks. The nut is the fruit of the kola tree, an evergreen native to the tropical rainforests of Africa. 7. Yerba maté, another South American holly leaf, that originated in Paraguay and was first chewed and brewed by the indigenous Guaraní people. The dried leaves are steeped into the most popular beverage in Argentina (more). Now, about National Carbonated Beverage With Caffeine Day: You can find carbonated chocolate drinks, carbonated cola drinks, carbonated energy drinks, even carbonated guayausa and yerba maté. Drink up!